Did you have the chance to visit any of our favorite Autumn Amsterdam Events yet? 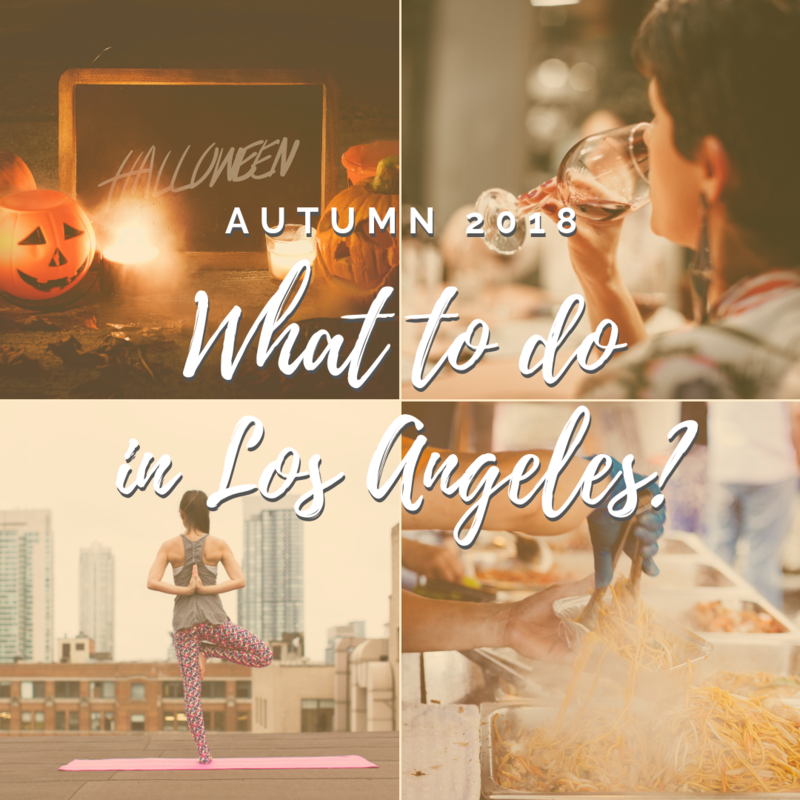 This month we’re coming back with some more great events you can enjoy until the end of the year- this time in the City of Angels, Los Angeles! The Twilight Concert Series is returning this time in October with some great indie favorites and up-and-coming artists. Make the best of your Wednesday night with good company and a great selection of Latin, Australian, Afro and South Asian beats with unique acts like Brazilian Girls, Betty Who and Fela! The Concert. Three stages, lots of beer and games- the ultimate music experience! Wine lovers, are you ready for some good wine and amazing food?! Every Wednesday night will add something new and unique to your wine experience with Chef Matt Molina’s culinary creations. What better way to release the stress after a long day at work, than enjoying an outdoor movie screening in Downtown LA. Excellent film choices, snacks and booze are guaranteed. And don’t worry about the chill fall nights because comfy lawn chairs and blankets are provided- the ultimate unique and cozy movie experience! Get ready for a month full of screams and horror. An immersive haunted house experience will definitely give you the shivers! You can expect some “intimate encounters” that will lead you to the one-on-one scenes of the Creep shows when members of the guest group are secreted away by performers- the ultimate Halloween experience! Food trucks and movies- How cool is that?! Enjoy a selection of great movies and yummy gourmet food under the beats of cool local bands’ live performances. To add to that, some of the outdoor locations allow your four-paws friend to be a part of this fun experience. Explore the beautiful city of Santa Monica through the interactive COAST Zones (arts, culture, sustainability, and mobility) under the beats of great local bands and DJs. Enjoy the fresh Autumn breeze while strolling or biking around the streets of Santa Monica along with stilt walkers. Art lovers, this is your venue! A night of open-door museums and performance spaces around the Pasadena area in Los Angeles will give you the chance to dive into art and culture. You will be able to take advantage of the free shuttle bus services. On your way to yet another museum or cultural venue you will be able to recharge your energy with some yummy food including local brick-and-mortar Pie’ n Burger and Churro Stix. This is the ultimate dream experience for every foodie and shopaholic in town. You will be able to enjoy lots of delicious food and retail vendors! And to make it even better, the parking is free for the first two hours. You will have plenty of time to take advantage and enjoy your Sundays with good food and music right up until the Christmas holidays. Dive into the fall season with Chef Steve and his fall-flavored recipes. Fall is the season of hot soups, stews, and roasts rich in flavors and yummy holiday desserts. Prepare for lots of fun and creative cooking. And what better way to enjoy a selection of flavorful Autumn dishes than with some homemade mulled wine?! Tickets start from 45$ per person and 80$ for 2 people. Did you know that Emotional Intelligence may affect your behavior and daily performance? It is closely related to your personal and professional success! This free class will give you the chance to become familiar with the main components of emotional intelligence, the best ways to control your emotions when facing difficulties or solving problems and to learn useful techniques for boosting your effectiveness and work efficiency. The free Griffith Observatory’s monthly Public Star Parties will take you on a starry night adventure. Not all of us have a telescope at home to admire the moon and the stars, so this is a great opportunity to enjoy a fun and educative night with good company. You’ll be shooting for the moon but don’t worry- even if you miss, you’ll land among the stars! Sometimes it is difficult to always stay true to yourself, isn’t it? This mindfulness class will help you free yourself of any judgment and express your inner self in the best way. You will be creating waist beads for everything important that you are working on, moving towards and focusing on. Get creative and pay attention to what different colors and color combinations mean to you. Additionally, you will be able to become familiar with what waist beads represented in the past and the purpose of their creation, learn how to create one and enjoy a nice meetup with your fellow class mates. Finding you inner balance and reconnecting with yourself is an important part of understanding yourself in order to grow personally and professionally. Mindfulness is a powerful meditation technique that will help you reduce the daily stress. No experience is required so the only thing you have to do is join the class. Are you ready for a unique vegan “cooking” class full of surprises? After relaxing a bit with a yoga class, you will move to the cooking part. All natural products (organic herbs and fruit, superfoods, gluten-free and soy-free ingredients) and drinks (fruit-flavored water and tea) will be provided. Chef and certified health coach Carolina Rocha you will take you on a fun health adventure full of surprises. After the Amsterdam October selection of performances, this is yet another great ballet performance of the Moscow Ballet that you will be able to enjoy. What better way to prepare for the upcoming Christmas holidays than with this beautiful piece- the Great Russian Nutcracker?! Filled with positive vibes and surprises, you can expect to see premier Russian dancers, larger-than-life nesting dolls, handmade costumes, local dancers and much more. It’s a great family event to embrace the spirit of the merry and cheerful holidays. We can't wait to hear your thoughts about our October event pick! We kicked off the new season with lots of good vibes, fun and laughter! Be proactive and make the best of October!